More ways to customize your party package so it will be perfect for you and for your child! Add a cake! For a fraction of the cost of a specialty baker, Robin can pick up a delicious cake for you at a local baker, bring it to the party, and top it with fabulous, handmade paper cake decorations that perfectly fit your theme, including a mini bunting with your child's name! Pricing depends on the cake size and other details. Pictured on the left is a huge 12" all-American chocolate cake with fudge filling, which would serve at least 24 people, and with the decorations as shown this mermaid cake would only be $50! And the best part? One less thing for you to think about, Robin will simply bring the cake right to the party for you. Cake flavors depend on our suppliers but most popular are white or chocolate cake, with either vanilla, strawberry or chocolate filling, and any color you wish for frosting and sprinkles! Gluten free cakes or cupcakes are available for an additional fee. $4 each - a themed bag with 4-5 small toys and candies inside! The classic option. $6 each - a cute stuffed animal or plush doll, and a lollipop! A fun option for many themes. $8 each - a few small toys and candies, and a dress-up accessory to fit your theme! Such as a pirate hat, fairy wings, princess crown, train engineer cap, cowboy/girl hat and bandana, and so forth. $9 each - a few themed candies and small toys, plus a special handmade item such as a custom handcrafted necklace. $12-$18 each - Deluxe dress-ups to take home! Specific items depend on the theme but examples are a fairy outfit (tutu, wings, and wand), satiny princess capes, superhero capes, mermaid tail skirts, Harry Potter Hogwarts house robes, and more! $2.50 each - Would you prefer not to send home a bunch of small toys, but one lovely memento instead? How about a custom, individually hand-decorated sugar cookie, wrapped in cellophane? These make lovely, classy favors. Sourced from a local small business! Minimum 12 cookies per order. Or for $7 each - a custom sugar cookie and a cute plush toy! Minimum 12. Add a tray of cookies for the snack table! Only $40 more for a tray of 2 dozen! Instant photos! These credit card size mini pictures are perfect party favors! 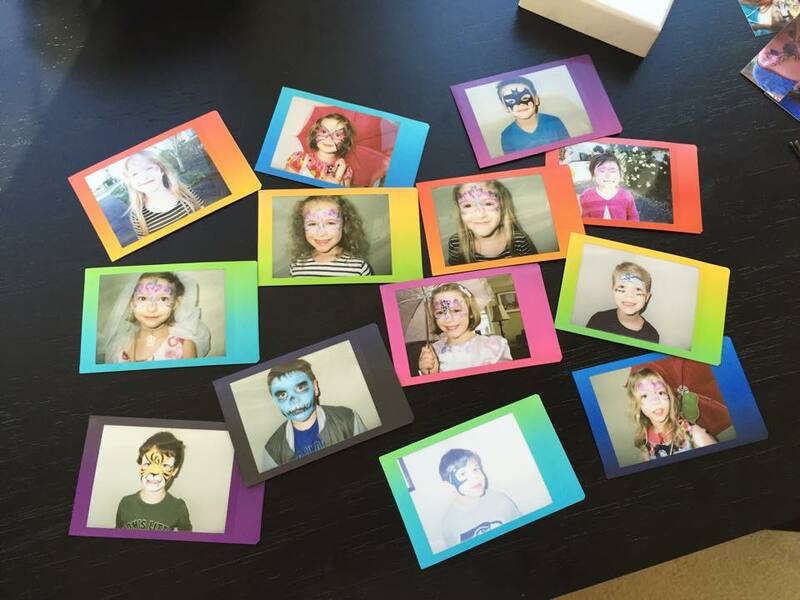 Let each child take home a photo of their painted face, or perhaps a photo of themselves with the birthday child! And kids of the digital age find these polaroid-style photos fascinating, watching them develop before their eyes! $30 to rent the camera and enough film for 10 photos, each additional pack of 10 photos is $20. Party Scrapbook! A fun activity for tweens, teens, and adults! Includes a scrapbook, 20 8" x 8" pages of patterned paper, stickers, embellishments, patterned washi tape, plus of course the use of the special instant camera, and 4 packs of film (enough for 40 pictures)! Guests will have a blast creating a special scrapbook of memories, for the birthday person to treasure! $195 includes everything mentioned. Additional packs of film $20 ea.